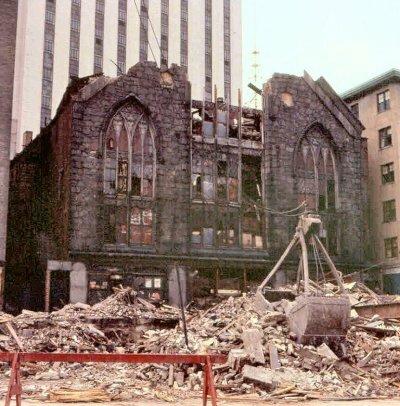 John Munsey, who now resides in Delray Beach, FL, was attending B.U. 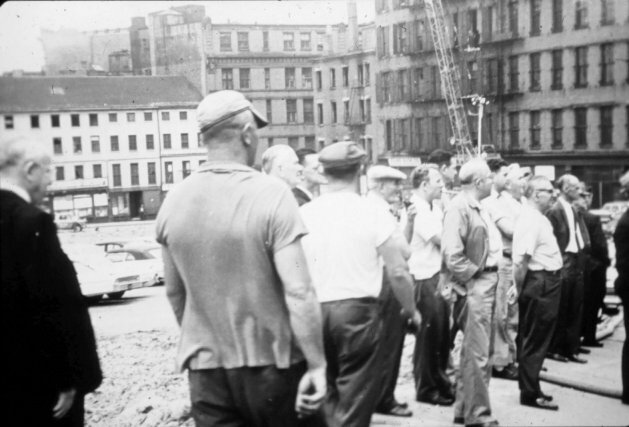 (Class of '62, Eng) when the Square was being demolished. 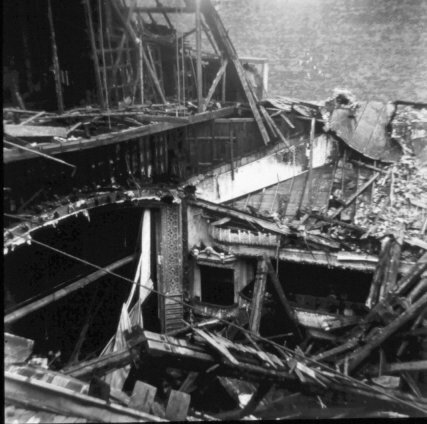 He was kind enough to send us some of the following photographs which, as far as we know, have never been published. 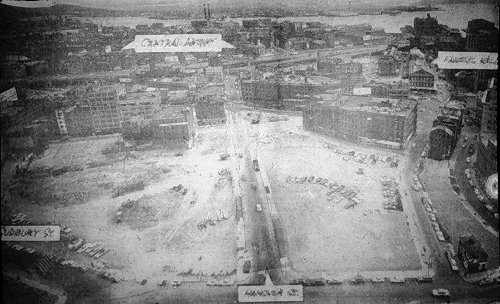 The first shot from John is of The Old Howard in April, 1962, just days away from being wiped off the face of Boston. John wrote that his pictures "were taken with a mini twin reflex (Topcon)...purchased at a camera shop on School St. for $29.00....took awesome pictures....127 film Ektachrome 60....long obsolete....With the overhead viewer one was able to frame perfectly....We had to use blue flash for daylight film..."
Another great shot of the demolition of the Old Howard by John. 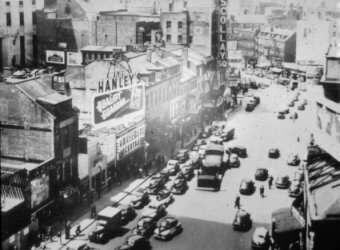 A box seat can be seen at the center of this B.R.A. 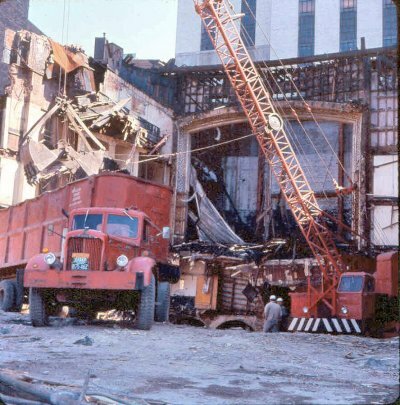 photo of the Old Howard's demolition. Crane w/Ball was outside about to demolish..... yelled at me... 'Get the hell out of there!' But I got the Pic !!!!" 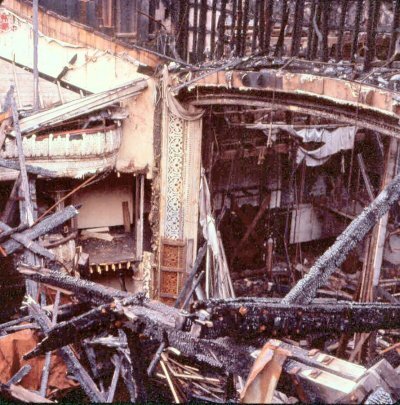 back wall we can see into the theater) which is being demolished in this 1962 B.R.A. photo. 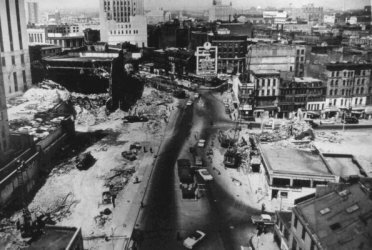 is about to lose the battle to the wrecking ball in this 1962 photograph by John. 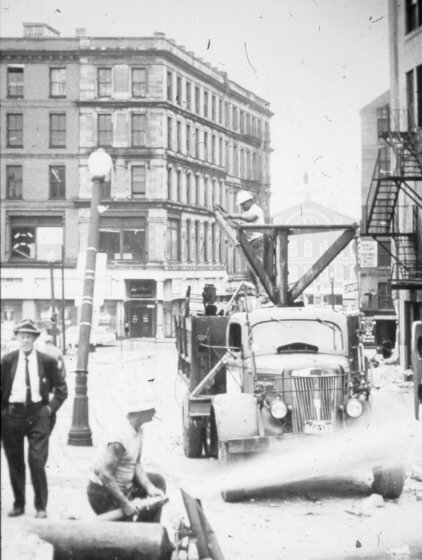 another building in Scollay Square in either 1961 or 1962.
this photo was taken circa 1961 on Brattle Street. 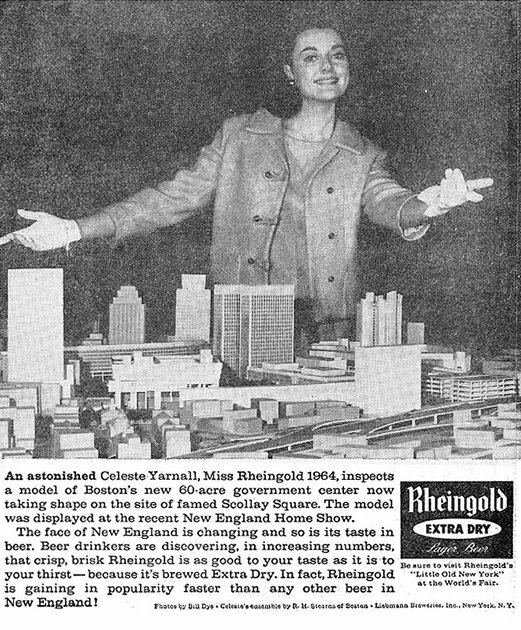 have not yet been torn down, but everything between Brattle and Hanover is gone, save for a couple of structures. 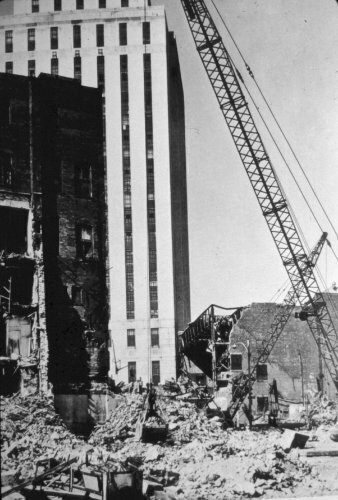 Tremont Row, just below Pemberton Square and the two courthouses, has also been demolished by this time. From the opposite direction (the top of the "new" Courthouse in Pemberton Square) taken a few months after the previous picture. 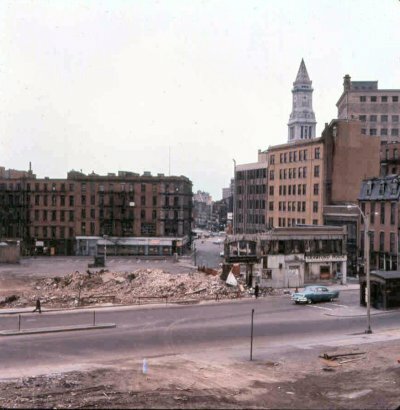 Now the buildings between Cornhill and Brattle Street (on our right) have been removed. Even more room for parking! 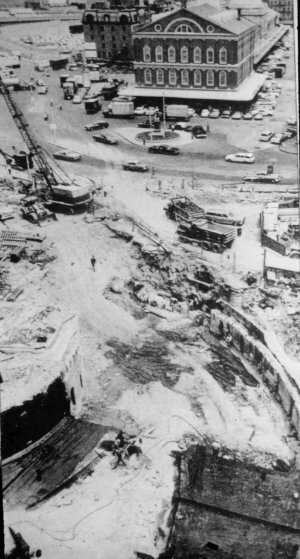 up a portion of the tunnel (notice the tiles on the underground wall) between Scollay and Adams Square. 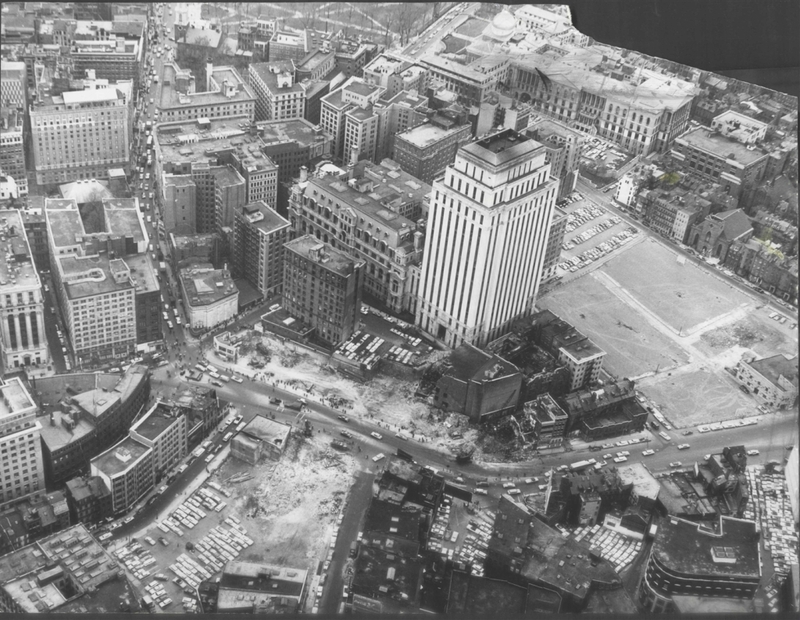 background we see pre-renewal Dock Square and Faneiul Hall, while further back is Quincy Market. 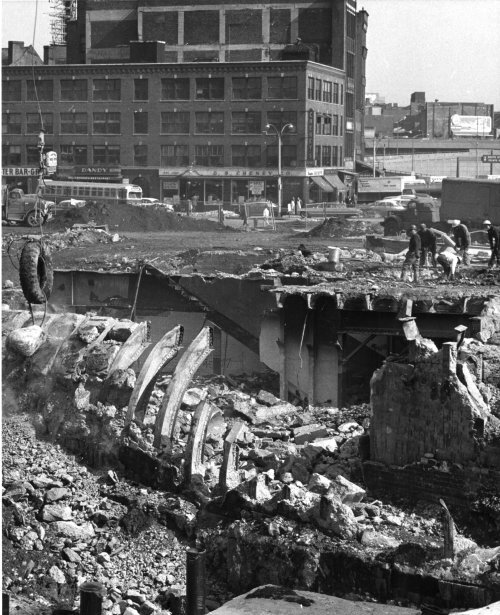 A really terrific view, from 1963, of the tunnel being dug for the realigned Green line trolley, which would now run from the new Government Center (Scollay Square) stop to Haymarket, but which used to stop at Adams Square before it, too, was demolished to make way for City Hall. 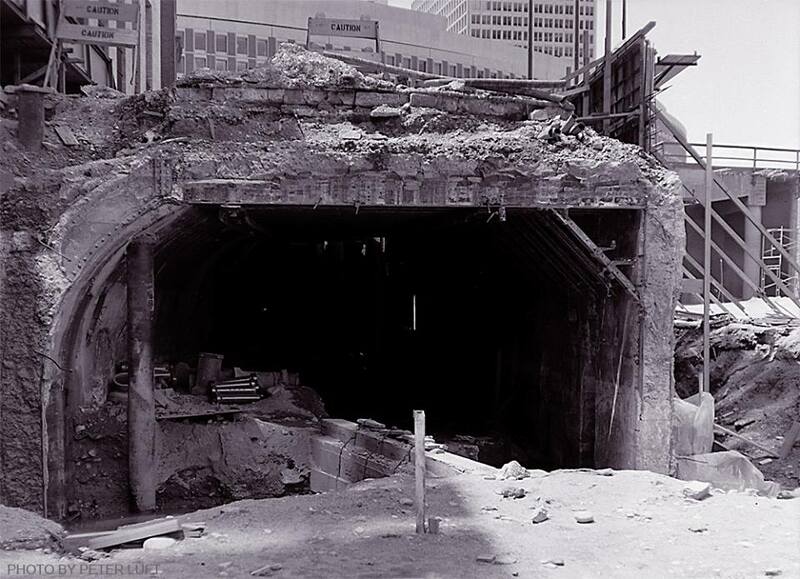 By the way, it is true that a portion of the old tunnel from Scollay to Adams Square was left intact. 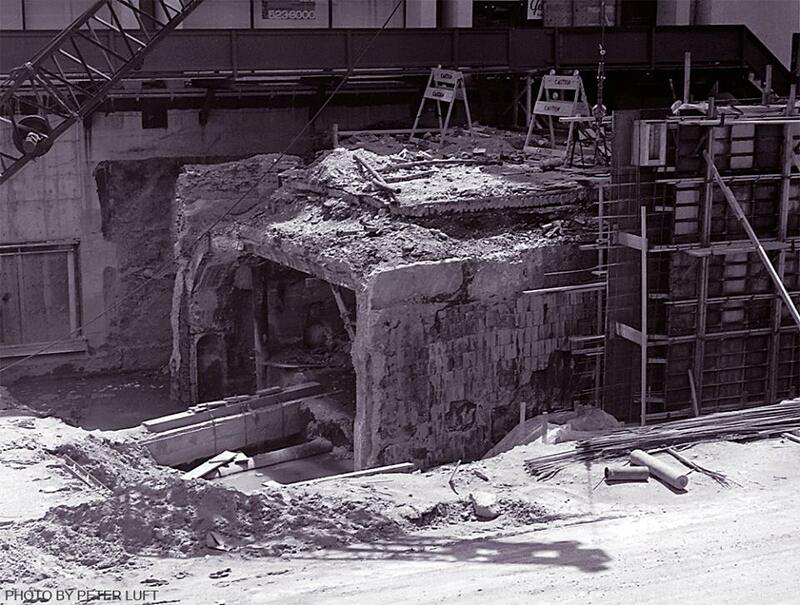 In the 1980s it was discovered that this section of the old tunnel could be reached from the basement of City Hall. 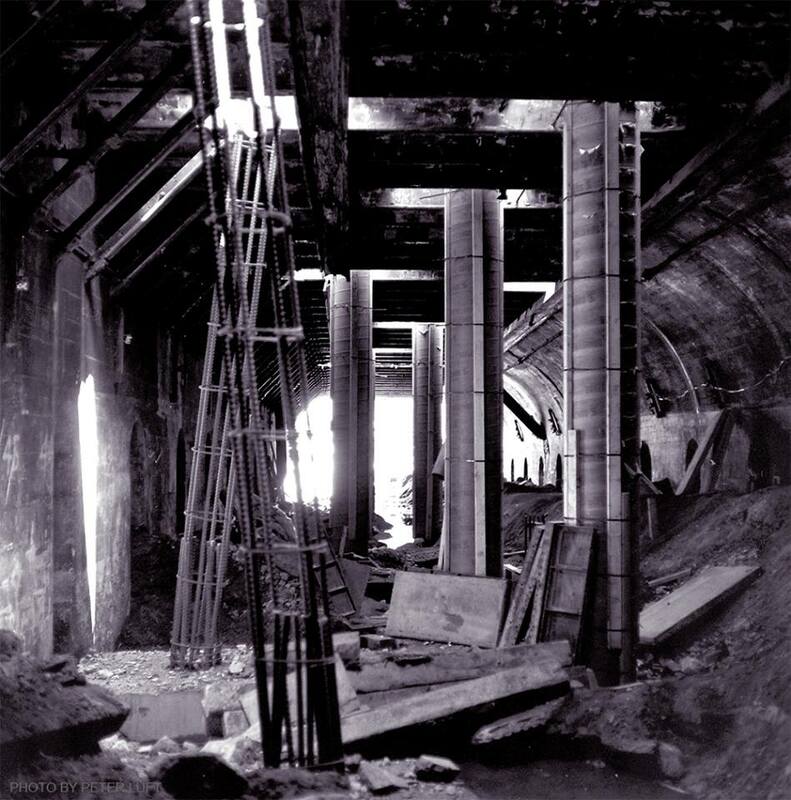 Desperate for space, the city installed lighting and now uses the tunnel for storage. 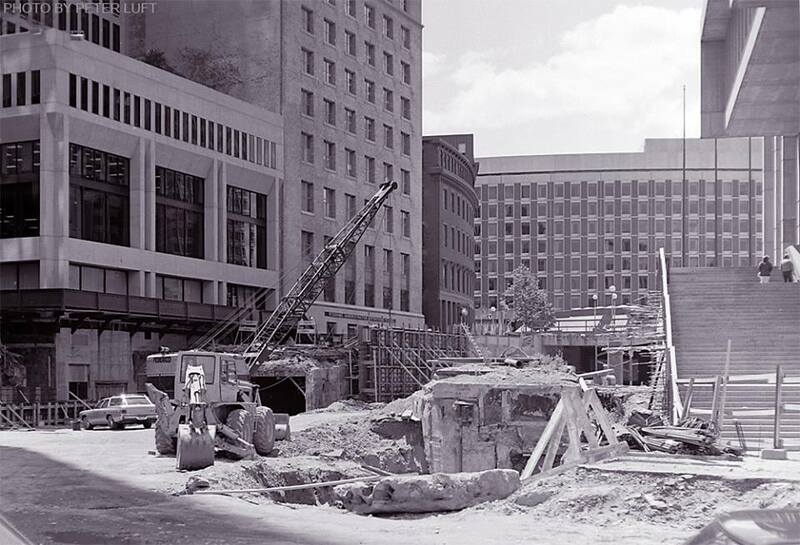 "By 1972 the Government Center project was winding down, but the breached Cornhill Street tunnel (Scollay Sq. 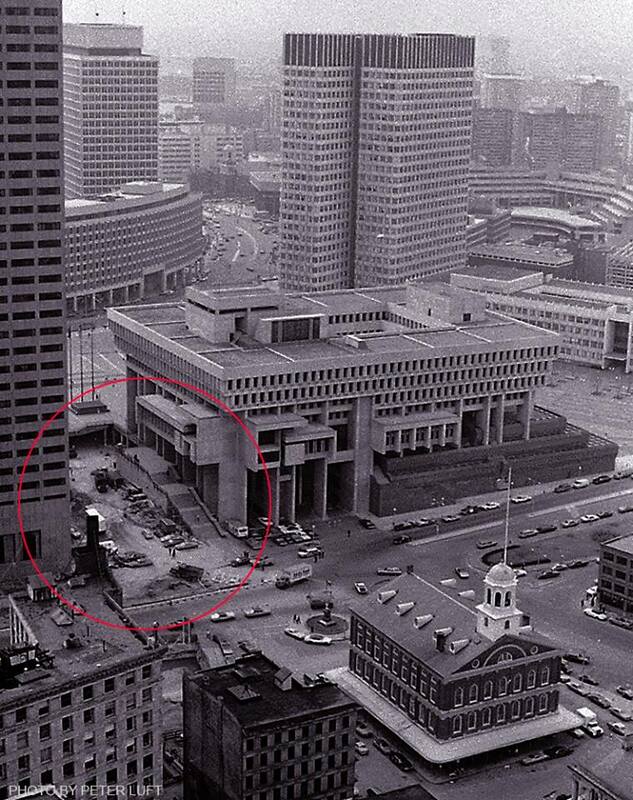 → Adams Sq.) was not quite buttoned up. As a curious teenage independent transit researcher, I stumbled upon this breach by accident, but understood what it was and took these photos. They've never been posted before." Would our intrepid teenage photographer attempt to enter the abandoned tunnel? Thank you, Peter, for sharing these terrific photos of your adventure.